Steve Smith is the latest candidate for this dubious accolade. But before the kiss of death is applied to him, we must preface the big call with these provisos. First, no cricketer will match Bradman’s batting record. But in the actual way he bats, Smith is the closest of any successful batsman, in Bradman’s time and to the present day, to bat in what may be called The Bradman Method. Second, rather than calling Steve Smith the “next Bradman,” we should think of him as the first batsman, other than The Don himself, to bat with great success using virtually all of the elements of The Bradman Method. It is one of the great mysteries of cricket history and coaching that up to Steve Smith no great batsman has played in a manner that even remotely resembled The Bradman Method. Don Bradman himself used to say that Sachin Tendulkar was the batsman who most resembled his way of batting. With great respect, I would say this statement was well-meaning nonsense. Tendulkar’s batting was the epitome of the traditional MCC batting method. He was a Mozart of the traditional method. Bradman’s method violated all the basic principles of the traditional MCC batting method. He was a self-taught improvisational genius, a cricket equivalent of the jazz pianist Oscar Petersen, who on the concrete pitches of his youth developed a technique that was personalised, effective and startlingly original in its method. No player will ever emulate the batting average of Bradman over a decent period of time. 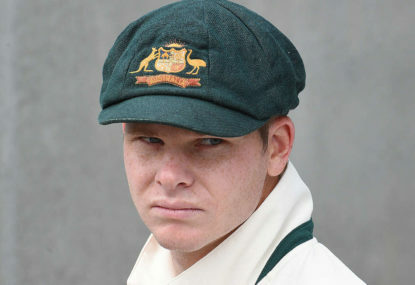 But, as Steve Smith is demonstrating, The Bradman Method can be used to achieve spectacular results for players prepared to work on acquiring the technique. 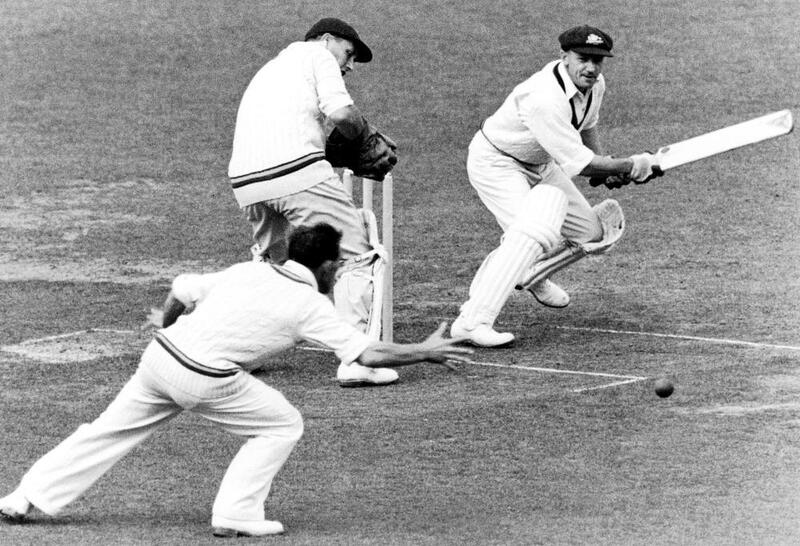 Bradman famously was bowled by the leg-spinner Eric Hollies in his last Test inning for a duck. If he had scored four runs in this last innings, he would have averaged 100 in Test cricket. 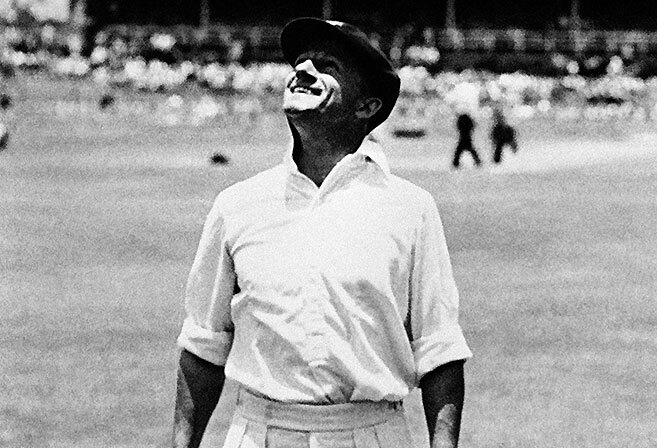 Cricinfo records Bradman’s Test batting statistics: 52 Tests, 80 innings, 6996 runs, highest score 334, average 99.94, hundreds 29, fifties 13. This extraordinarily high conversion rate to centuries when the 50 mark was passed indicates that The Bradman Method was not only brutally effective in destroying attacks. It is also the soundest method of acquiring big scores. To make a comparison that statisticians would appreciate, Bradman’s Test batting average is four standard deviations on a Bell Curve from the next batsman, Steve Smith, at 62.93. 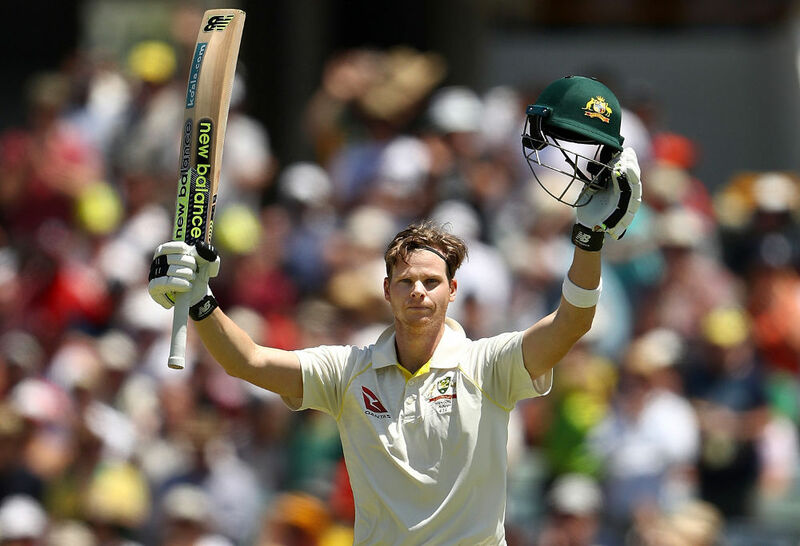 Smith’s Test batting statistics, up to the first innings of the Perth Ashes Test: 59 Tests, 108 innings, 5796 runs, highest score, average 62.32. Only Adam Voges of the other batsmen to have had 20 innings, in 20 Tests and 39 innings, averages over 60, at 61.87. And of the other current Test batsmen, aside from Steve Smith, Virat Kohli has the best batting average, 53.75. There are two significant factors in all of this. First, Steve Smith has a significantly higher average than Kohli. Kohli uses the MCC method. Smith uses The Bradman Method. 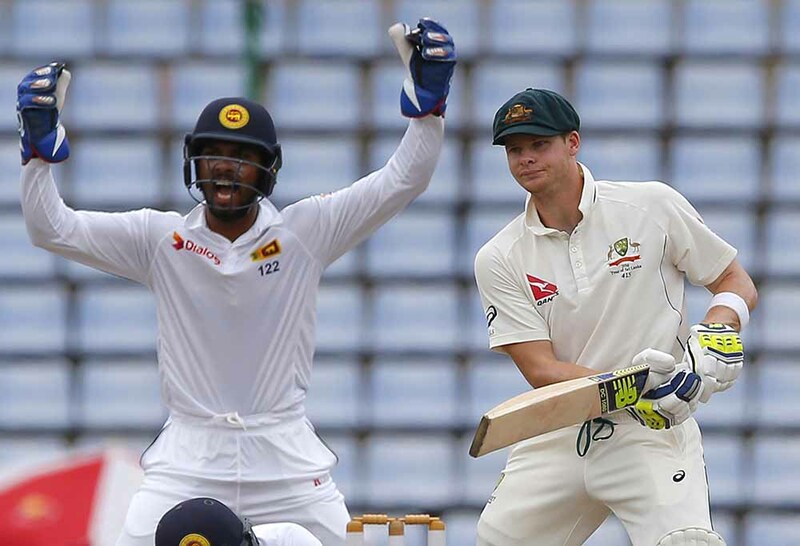 Second, in his first 24 Test innings, Smith did not score a century. In his next 84, Smith has scored 22. And here is the most interesting aspect of all of this. Smith’s early sequence of failures finally came to end, rather abruptly in fact, when he decided to adopt The Bradman Method of batting in a Test. This happened four years ago at Perth. The result was his first Test century on home soil. Don Bradman has best described The Bradman Method in a letter that Anthony Shillinglaw, the foremost authority on it, quoted in an article published on The Roar 19 March, 2008 – ‘Don Bradman’s ability to bat on and on‘. “In general, I think that many coaches stifle the natural ability of young players by rigidly insisting that they do not move until the ball is delivered and that they adhere to a perpendicular bat with left hand control. “Movie strips of me batting indicate that I started my backlift before the ball was delivered and that the bottom of my bat was approximately level with the tops of the stumps at the instant of delivery. The two essential elements of The Bradman Method were the ‘Continuous Rotary Process,’ (Shillinglaw’s phrase), which gave a fluidity to his batting. Film clips reveal that when Bradman moved into a shot, off either foot, either attack or defence, that everything flowed. He did not plant his feet and wait for the ball to arrive. The process of making his shot was a continuous movement. Tony Shillinglaw is quoted by James Buckley in the SMH – ‘Just like the Don: Why Smith’s batting method is masterful‘ – in explaining why the Continuous Rotary process worked for Don Bradman and now for Steve Smith: “Bradman’s bat never stopped once it started. Because Bradman was rotating, his head was still, but his bat was moving. When the ball came out, the bat just reacted to the ball … Once the ball came out, the ball dictated what shot he played. Greg Chappell makes the point, too, that Bradman kept his hands close to the body rather than the orthodox method of extending the arms and the bat to a high point in the lift in the manner of the famous Victor Trumper photo. The second element involved the placement of his right (bottom) hand on the bat. The MCC coaching manual calls for holding the bat in such a way that the top and bottom hand are in an aligned V. The Bradman Method called for a V in the top hand and the bottom hand to be turned around so that the grip was behind the bat handle, rather than along it. Bradman suggested his grip did not elevate either hand in importance in the grip and in making the shot. In fact, his grip accentuated the control exercised over the bat by the right hand. I am a natural left-hander. Everything I do with one hand, say playing tennis or writing, I do with my left hand. But anything I do two-handed, say using a golf club or a cricket bat, I do ‘right-handed.’ That means that my leading hand on the club or the bat is my left hand, which is my strong hand. It has always puzzled me that right-handers bat in a way that their strong hand is not their leading hand on a cricket bat. The great virtue of the Bradman closed bottom hand grip was that his natural leading hand, his right hand, controlled the bat for a majority of his scoring shots, his pulls and cuts. As a youngster, I actually tried to emulate this grip but I found it difficult to maintain any control over the bat and the ensuing shot. But thinking about this recently I have come to the conclusion that Don Bradman and now Steve Smith used their bottom hand grip to allow them to play pulls and cuts rather like a tennis shot, rather than a traditional cricket shot. It should be remembered in this context that Bradman, as a teenager, gave up cricket to concentrate on playing tennis. Steve Smith, too, is apparently a very good tennis player. Moreover, the closed bottom hand grip gave Bradman such terrific control over his pulls and cuts that he only hit the ball in the air when he was trying to hit a six, which he virtually never did. Bradman, in fact, hit only six sixes in Test cricket. There is something, too, about The Bradman Method that allows a batsman to become more profusive in his run-scoring the longer he is at the crease. 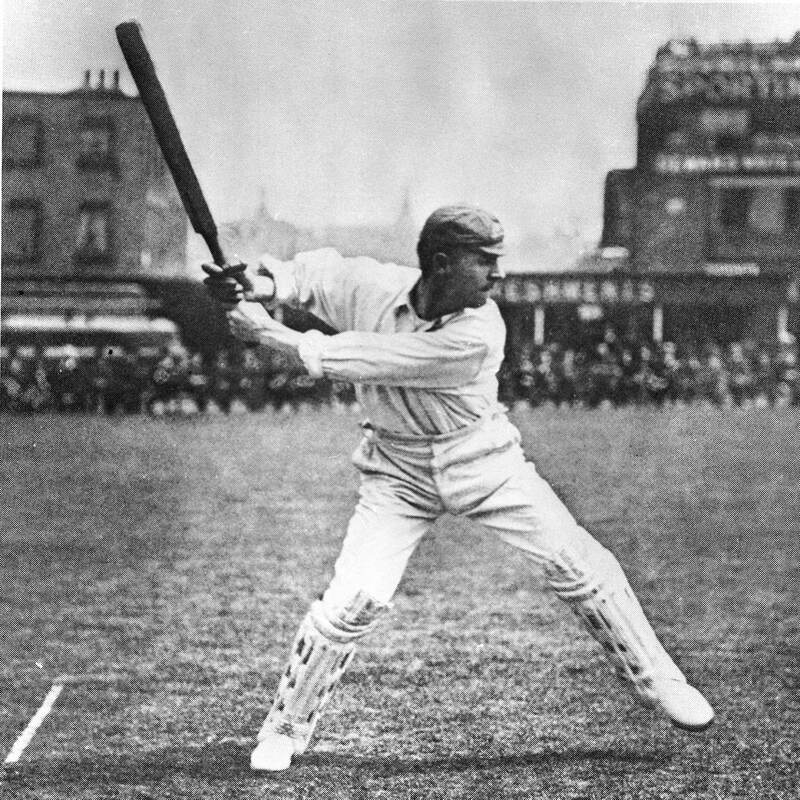 The Melbourne scientist Charles Davies has produced these interesting and provocative facts about how secure the seemingly unorthodox Bradman Method is: “For scores below about 15, even though Bradman was very good at avoiding dismissal, his chances of dismissal were within the range of other great batsmen. (Jack) Hobbs, for example, was more reliable at reaching double figures. The Australian reported before the Perth Test that Steve Smith, using The Bradman Method, “a highly unconventional technique that looks flawed but seemingly isn’t,” had scored 4686 runs at 72.09. He averages 86.11 in Tests in Australia. Smith went on to score 239 in the match, with his first 100 being his fastest ton in Test cricket. The question for cricket coaches arising from Steve Smith’s dramatic transformation into one of the great batsmen in Test history after becoming a Bradman clone is this: why doesn’t The Bradman Method become regarded as the conventional method, and the conventional MCC coaching manual method discarded as unconventional?